Looking back on a recent visit to the Newport Mansions which are situated on the scenic Rhode Island coast, I am struck by two thoughts. While the utter decadence is impressive and stunning, even more moving is the way these people and this Gilded Age faded from glory. The mansions sit there, perched with an unabashed grandiosity, like a peacock in full display, aloof but not necessarily condescending, standing as the epitome of American grandeur and opulence. These edifices speak of an age when class and respect were paramount in society. Ostentatious? Perhaps, but I think the populace of the past were more accepting of the "rich," for it was they, the industrialists, that brought the ravaged post civil war country to the forefront of the modern world, matching the accomplishments of Old World European money with American grit and ingenuity. To a certain extent, those with less will tend to resent those with more, but in today’s world, it goes a bit further in that those with less feel the “right” to be given more without necessarily working for, or taking the risk for that gain which is, in essence, the basis of the capitalistic system that was, and is, a foundation of this country. Socioeconomics aside, these mansions provide a fascinating glimpse into a sort of storybook time in American history. 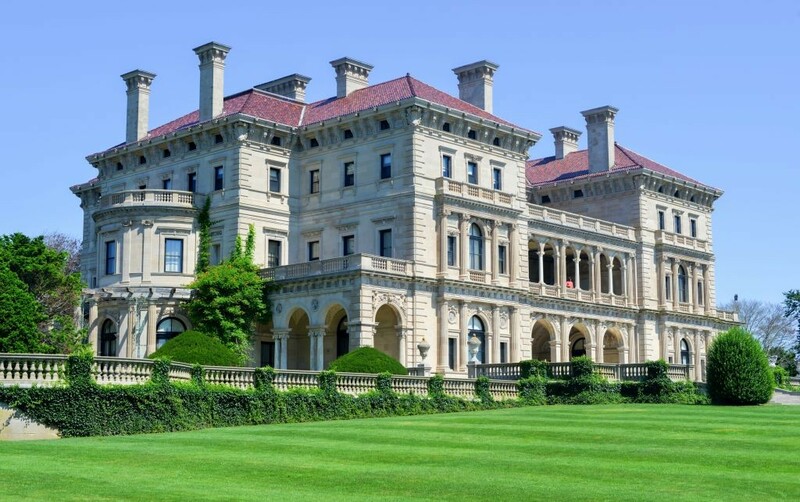 The above pictured residence, "The Breakers", was built by Cornelius Vanderbilt II grandson of Commodore Vanderbilt who amassed the family fortune in steamships and railroads. 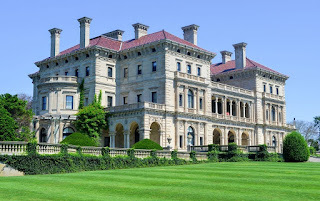 This was but a "summer cottage" for the Vanderbilt family who would have to suffer through a Newport summer on a mere 125,00 sq. ft. residence. That wall panels of the Morning Room were gilded in platinum speaks to the level of detail and grandeur. That each sink had three faucets, one hot, one cold, and one for salt water speaks to it. That the immensity of the solid marble tub required it to be filled and emptied three times before it would maintain the necessary heat speaks to it. The architectural planning and engineering which forged this building that housed the innumerable guests and parties remains an example of the preeminent status of the families who dwelt in the mansions of the Gilded Age. However, were those edifices actual persons, they would have made for a great tragic novel. Times changed as they always do. The societal clique that formed the fabric of life around the mansions moved on to other circles and the maintenance became more and more of a drain on the families. The once great symbols of status and culture were labeled “white elephants” and became passe. They surely would have passed into obscurity had it not been for the Newport Preservation Society which bought and now maintains the mansions. At one point, an unoccupied Rosecliff Mansion fell victim to burst water pipes during a frigid winter. The great ballroom was flooded with water which eventually froze leaving the place in tatters and she sold for a mere 165,000 USD- exactly what I paid for my one acre lot of land. Oh how the mighty fall. Standing in stark contrast to the Newport Mansions is a humble cave in Ireland known as St. Kevin's bed where the aforementioned occupant lived as a hermit for some seven secluded years after his ordination. As legend has it, he was led there by an angel. In fact, there are many legends attributable to St. Kevin, but one of the more interesting ones is how, while holding his arm out of the cave, a blackbird came to rest on it and lay its egg. St. Kevin then maintained that outstretched arm until such time as the fledgling hatched. Besides the religious connotations of the legend, it has spawned two significant offspring. 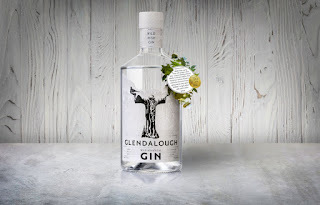 One, it is the basis of the famous poem, 'St Kevin and the Blackbird' by Nobel prizewinner Seamus Heaney, but more germane to this blog is the inspiration behind Glendalough Gin. -"For us, the story of Kevin and the blackbird, shown on our bottle, sums up the strength of character needed to turn your back on a privileged birth, break out on your own and still succeed on your own terms." 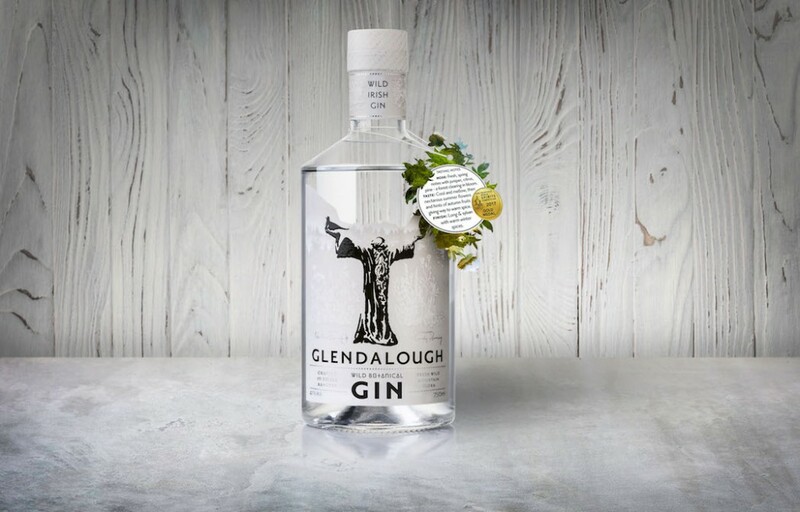 A characteristic of Irish Gins is their use of locally foraged, fresh botanicals that impart a sweet grassy fragrance evocative of the Irish countryside and Glendalough Gin is no exception to this rule. In this case, the locally foraged botanicals enter the still just 24 hours after being harvested. The more hardy herbs are macerated in the pot while the delicate varieties are hung in a basket above. The botanicals in this case include licorice root and bark, lemon, elderflower, red clover, yarrow, ox eye daisy, wild raspberry, blackberry leaves, wild rose, watermint, sweet woodruff, lemon balm, sweet cicely, lady’s bedstraw and bell heather. The result is a decidedly herbal/floral Gin. The flavor is less juniper forward than your classical London dry with a somewhat softer more spruce like taste reminiscent of Wire Works Gin. Glendalough is replete with grassy, herbal notes with a hint of cooling lent from the licorice and mint flavors perhaps. This is a modern style Gin with a lot of flavor. This makes a simply marvelous Martini, however with such a wide flavor profile, I recommend skipping the Vermouth entirely-ice cold Gin and three olives will suffice! Enjoy your Martini my friends!